You may remember that I referred to jacket potatoes 'baked' in the slow cooker in my post about unusual crockpot recipes. Ever since then I've been wondering how it compares to a good old fashioned oven-baked spud. Would the skin be crisp? Would the potato be fluffy inside? Would it taste any different? Well, I got on and made them, and I found that they are quite different to a regular oven-baked potato. Firstly, as I expected (because the slow cooker works by cooking everything with liquid or steam), the potato skin was not crisp. The long, slow cooking time basically steamed the potato whole, so it was just like a giant boiled potato really. It caught a little on the bottom where it was sitting on the crockpot's base, but that was about it. No satisfying crunch as you cut through with your knife. The inside of the potato was quite firm, again not overly fluffy, but like a boiled potato. It cut cleanly in half. But there are benefits. One is fuss. You just prick the potatoes with a fork, rub with a little olive oil and sprinkle with a little salt and then chuck them in the slow cooker. Replace the lid and leave for four hours on high. Less than five minutes preparation and then you forget about it for four hours, or until you're hungry. The other is money. There's that often-quoted claim that a slow cooker runs on a similar amount of electricity to a lightbulb, so it's a much more cost effective cooking solution. Compare that to having your oven turned up as high as it'll go, and blaring away for an hour or so. Environment-wise, I'm sure the slow cooker wins on this one. But if I'm honest, for taste and texture, the oven method really wins overall for me. I love the crisp skin on a baked spud - I look forward to its crispiness when I've schnaffled up all the fluffy, buttery potato flesh inside. 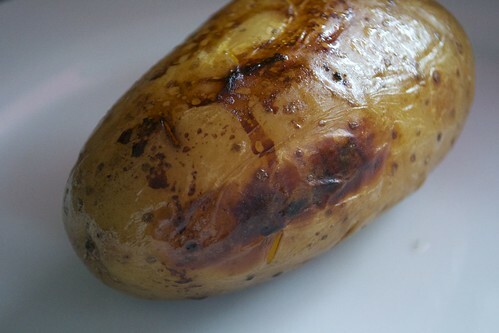 The crisp skin lends a flavour of its own, which is completely lost when you slow cook the potato. If I was busy in the day, or if it was summer and I didn't want the oven on for an hour on full blast, I'd still cook potatoes in the slow cooker. You wouldn't really care once you got your toppings on. But for the perfect baked potato, I'm sorry crockpot fans, it has to be blasted in the oven. 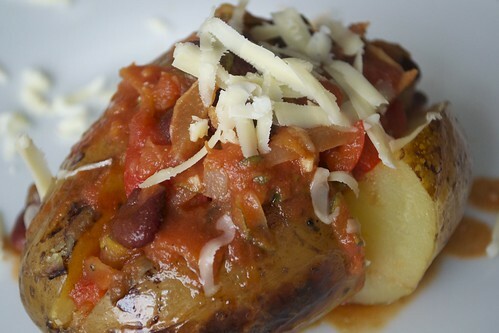 Have you ever cooked jacket potatoes in the slow cooker?